BitDust project is developed on the principles of automata-based programming and open project documentation movement. This is a programming paradigm in which a program or its fragment is represented as a model of some finite state machine. The distinctive feature of this approach consists in picking out each condition in which that process is in order to analyze the program behavior on the whole. State machines transition graphs are used on each stage of software development and final documentation. SWITCH-technology of automata-based programming was first introduced by Anatoliy Abramovich Shalyto in 1991. You are welcome to study suggested approach more in detail on the website of the academic department of "Programming Techniques" is.ifmo.ru of Saint-Petersburg National Research University of Information Technologies, Mechanics and Optics, and also by reading an article Automata-based Programming on Wikipedia. As a general principle the use of finite state machines for the realization of program logic as well as the automation of compilation of transition graphs to the source code in Python allow to optimize the development process considerably. I use a slightly modified method of automata-based programming. On the arcs of transition graphs the events, conditions and actions are marked in the format which is as close as possible to Python language syntax, moreover the color keys and text formatting are used. 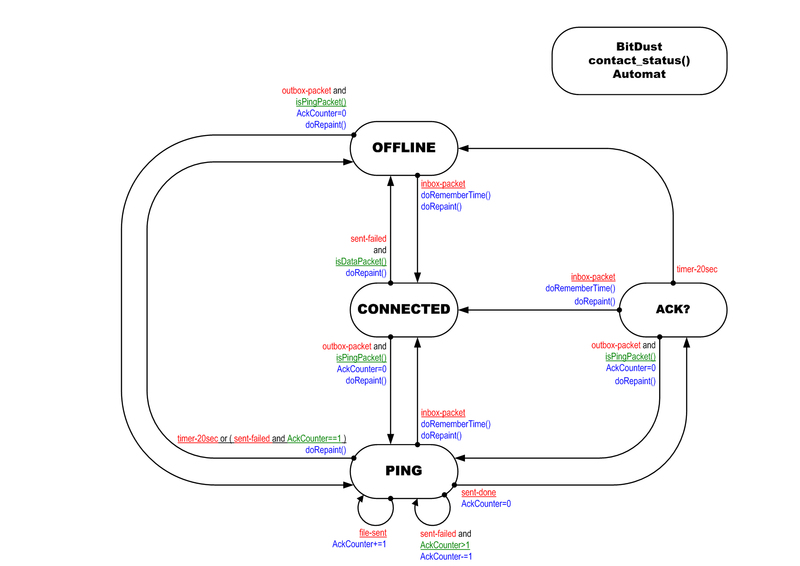 As an example, consider a simple finite state machine which is designed for tracking the current status of user’s connection to the given node in the BitDust network. In this picture you can see an automat called contact_status(), which has four states. Proper operation of the automat helps constantly tracking the current status of connection with the given node – you just need to check the value written in the state variable, which is the ContactStatus class member. For instance self.state == 'CONNECTED' means that user is on-line at the current moment. This code is automatically generated from transition graph vector diagram of the finite state machine and you do not need to code all that lines and so have no chance to made the mistake. The source files of the project can be automatically updated after any modifications applied in the finite state machine, how it works is described below. Within the concept of the open project documentation the transition graphs are used not only at the stage of design and development, but also in documentation and product description plan. This helps eliminate errors in programming logic – with this process automation the working code becomes absolutely identical to the visual framework of finite automat. Also it helps all sides to understand each other more clearly: customers, developers, testers, end-users. This is very simple code, but it makes a useful action and calls an external code - actions and conditions become separated from the state machine and target logic. For every new network connection a new single instance of this automat will be created, method A(idurl, event, arg) creates new instances and refers to existing instances of the automat. In other words we can divide useful logic from the rest of the code within the development process and also structure the key interactions throughout the software. This is depends from developer and his understanding of the whole process. In fact, there is no need to create the machines only for the machines themselves. In my understanding, the purpose of automata-based programming is to highlight the key abstractions and processes described in the program and make their logic more clearly understandable. In the future, you can always go back and instantly remember how this piece of code works and very easily change the program behaviour. The majority of the Bitdust code is implemented a traditional programming methods and machines are used only for the construction of the top level classes. As usual, the best product is obtained when the balance was struck. This approach reduces the likelihood of logic errors in the program to zero, while troubleshooting in most cases is the most complex and high-runner process at the stage of development and tests. As a rule the functional of software is divided into multiple methods, which can be programmed and tweaked separately or in a specially created test environment with the use of different automatic test and tweak procedures. Transition graph is a graphical representation of the multiple conditions of the automat and functions of transitions between them. In the visual framework of the finite state machine you can see the logic of algorithm and all the possible process stages, outcomes and interconnections. States and transitions form the program behavioral model of the control over the specific unit or process. State is the key element of the finite automat, it divides the stages which the algorithm does. While the program runs the automat does transition between its states. It can get in the same state several times or on the opposite not get in any predefined state. By transition from one state to another the testing of the condition, which is assigned to given transition, is preliminary conducted. The condition can be written as a statement in Python and can consist of function invocations, access to variables or status inspection of other automats. If the condition works, the transition to other state is conducted and the actions assigned for this transition are taken. These may include functions, statements in Python or other finite state machines invocations. All interactions of the finite state machine are done through events accepting and communication. They are transferred directly into the automat kernel and launch inspection of the transition between states. Microsoft Visio 2007 is used for creation of the vector schemes of transition graphs. Transition graphs of finite state machines, which control the behavior of BitDust client software, reside in *.vsd files. Below is a list of state machines currently introduced in BitDust software. You can click on every item in the list to look at transition graph of the state.